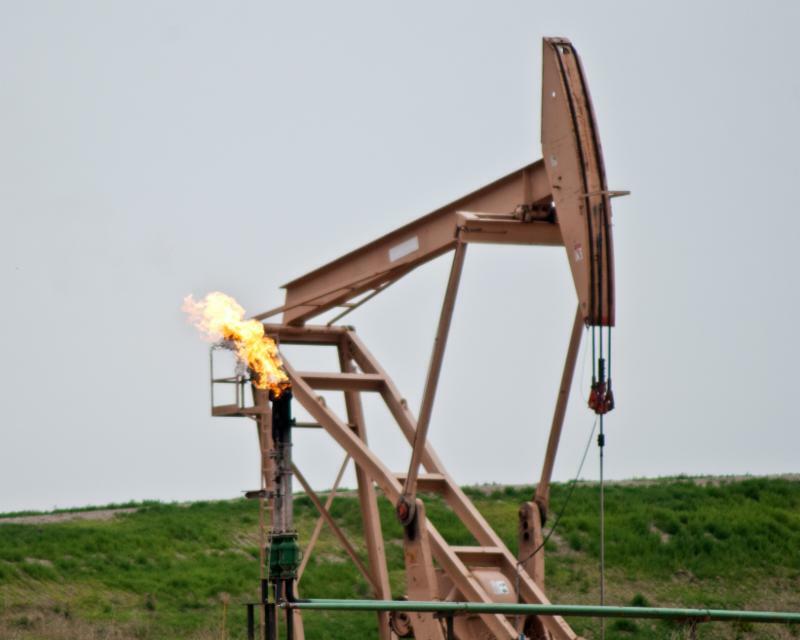 North Dakota oil producers are falling short of the state’s natural gas capture targets, but state regulators have adopted a wait-and see approach before taking enforcement action or revising flaring targets. Producers fell short of the 85 percent capture goal in September, mainly because growth in gas production is outpacing the industry’s ability to build processing plants to handle it. The target got even tougher to meet, increasing to 88 percent in November, but the North Dakota Industrial Commission took no action at its recent meeting primarily because the regulatory environment is about to change. The Bureau of Land Management announced in mid-November that it plans to delegate flaring regulation on tribal trust lands to the MHA Nation, and regulation on all federal lands outside the Ft. Berthold reservation to the Industrial Commission. Lynn Helms, director of the Department of Mineral Resources, said BLM's decision to grant regulatory authority to the state and tribe was welcome news. Helms said the new federal regulatory policy will affect the state’s flaring regulations once negotiations with the BLM and Tribe are completed. Helms says midstream companies need to accelerate plans to build gas processing capacity because gas-oil ratios are higher in the core area, and drilling technology continues to improve. Helms made his comments during an interview on the radio program, What’s on Your Mind. Click here and advance to the 27:44 mark to listen to the full interview. The new majority leader of the ND House of Representatives traveled to Medora this week to participate in a regional meeting of the Southwest Association of Counties. Rep. Chet Pollert, R-Carrington, spoke to the gathering of about 50 county commissioners and county staff. Pollert’s remarks were brief. He said he wanted to hear about the group’s concerns, and was there to meet people and listen to what they had to say. “I’m a believer in the two ears, one mouth ratio,” Pollert quipped. Rep. Pollert operates a family-owned grain and feed business. He was invited to the meeting by Billings County Commissioner Jim Arthaud, who chairs the southwest counties group which includes Adams, Billings, Bowman, Dunn, Golden Valley, Hettinger, Slope and Stark Counties. Several McKenzie County officials were also in attendance the meeting. 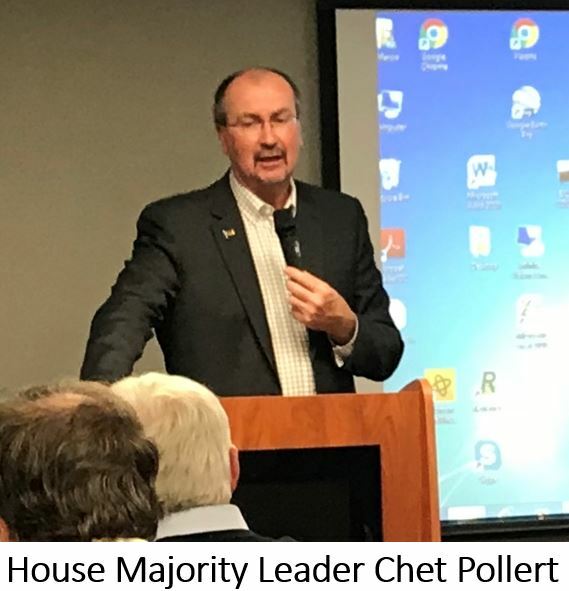 Commissioner Arthaud said he looks forward to Rep. Pollert’s “small-town leadership perspective.” The 2019 Legislature convenes January 3. New and returning North Dakota legislators will get together at the Capitol next week for the traditional three-day organizational session that precedes the start of the regular session in January. 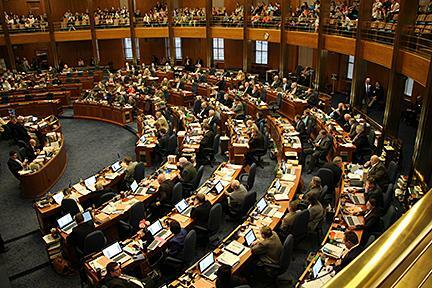 The organizational session kicks off Monday morning with training and orientation for newly-elected legislators. The Oath of Office will be administered to new members at 1:00 p.m. Monday in their respective chambers, with Supreme Court Justice Jerod Tufte administering the oath in the Senate, and Justice Jon Jensen swearing in new state representatives in the House. New and returning members will learn their committee assignments during the week, and committee chairmanship positions will also be announced. The highlight of the week will be Governor Doug Burgum’s budget address, scheduled to begin at 10:00 a.m. on Wednesday, December 5, to a joint session in the House Chamber. Staff in the Governor’s office have been meeting with executive branch agencies the past several weeks to develop Gov. Burgum’s recommendations for state government spending in the 2019-2021 biennium. The governor’s speech will be followed at 11:00 by a meeting of the legislature’s Budget Section in the Senate Chamber. The organizational session also includes presentation and discussion of workplace harassment policy and legislative ethics and laws, which take on additional importance as the legislature works to implement provisions of Measure One, an ethics measure passed by voters in November. 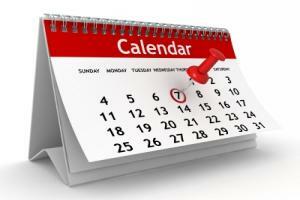 Click here for a rundown of activities during the December 3-5 organizational session. Click here to read the perspective of Minot's three new representatives. State communications and technology officials are negotiating with a vendor for development of a Statewide Interoperable Radio Network (SIRN), and intend to award the contract in December. 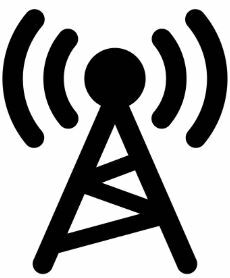 The ND Statewide Interoperability Executive Committee received proposals earlier this year for SIRN, which will allow radio communication among and between emergency responders and other state and local government jurisdictions during times of crisis or emergency. The big question remains is how state and local officials will cover the estimated $172 million cost of the SIRN project. The 2017 Legislature provided some seed money with passage of HB 1178, which required political subdivisions to impose 50-cent fee on communication services. It’s estimated the fee will generate close to $8 million by the end of the 2017-19 biennium. 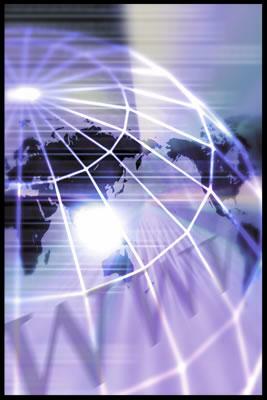 Section 8 of HB 1178 required all North Dakota entities operating dispatch facilities (PSAPs) to relinquish legal rights to any radio frequency required for the SIRN trunk system.The state Information Technology Department reports that 41 counties have signed the SIRN memorandum of understanding (MOU), and four counties have signed letters of intent to participate in the network. Five counties have either disagreed or partially disagreed with the MOU, two counties have not presented SIRN information to the county commissions, and one county has not responded to SIRN requests. Click here for more information about SIEC. Click here to read HB 1178. 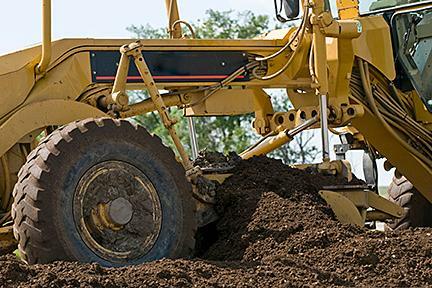 County road and bridge managers will gather December 12 in Watford City to discuss challenges, success stories and new innovations for building and maintaining roads in the oil and gas producing counties. 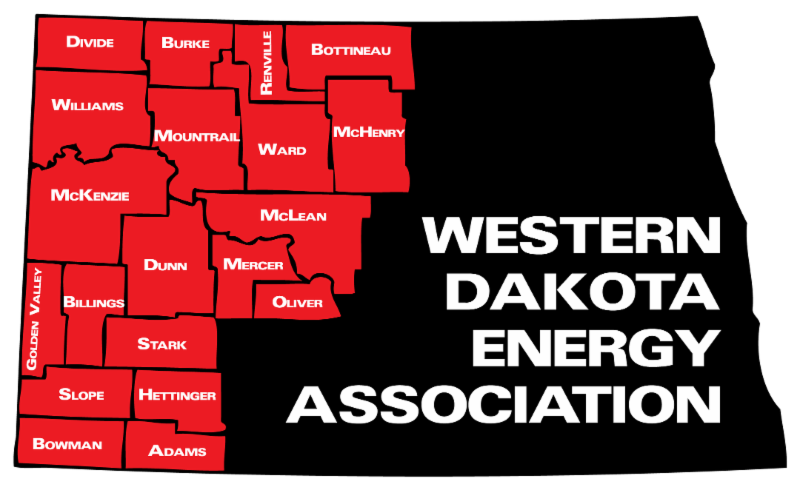 The event is organized by the North Dakota Local Technical Assistance Program in conjunction with the Western Dakota Energy Association. It features a roundtable discussion of best practices. Among the topics expected to be discussed is the rationale for temporary road closures and restrictions that are associated with rainfall or melting snow. Recent concerns expressed by the industry have caused some counties to take a second look at their policies. Oil industry representatives have been invited to sit in on a portion of the roundtable discussion. The preliminary agenda also includes topics such as de-icing and dust suppression, use of drone technology, new road base materials and stabilization techniques, and the DOT’s Sign Warrior program. McKenzie County Job Development Authority is supporting the event, which runs from 9:00 a.m. to 3:00 p.m. at the Rough Rider Center in Watford City. Pre-registration is required by December 5. Click here for additional details and registration information. 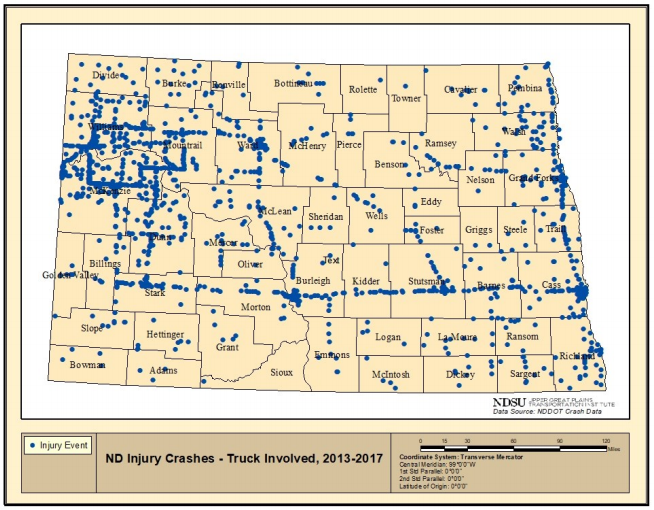 The early winter driving months of October, November and December are the most common time for truck crashes resulting in injuries in western North Dakota. A report by the Upper Great Plains Transportation Institute shows that Wednesdays and Thursdays in October, November and December are when most truck crashes occur. Although the number of serious injury truck crashes in the region has declined in recent years, McKenzie, Williams and Mountrail counties accounted for 42% of wrecks resulting in fatalities or injuries in the state. The report indicates the biggest factor contributing to personal injury truck crashes is weather. The second biggest factor is failure to yield. A new report recommends oil patch governments update public transit systems, upgrade their public transit fleets and coordinate with others to provide better service for less money. The report by the Small Urban and Rural Transit Center of the Upper Great Plains Transportation Institute is called, "The Impact of Oil Boom and Bust Cycles on Western North Dakota." The report examined the impact of the boom and bust cycle on transit ridership and community livability. A major finding of the research shows that recent industry activity caused transit ridership to nearly double from 2008 to 2016 due to the expanding local economy. The county livability indexes were classified ranging from 1 to 10 with Mountrail County showing the highest index value while Divide County generated the lowest. 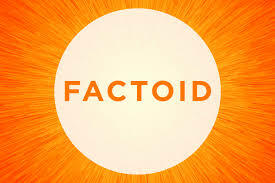 Oil companies spend approximately $292 million per week on oil well development in the Bakken Formation. About $200,000 of sales tax revenue is collected from each completed oil well, and about 80 oil wells are completed per month resulting in $16 million of sales tax revenue per month for the state.